Viz Reflectives was established in 2002 and are a major supplier of reflective materials. 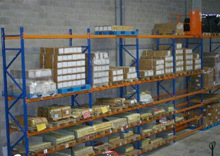 VR operates out of a 10,000 SQF facility in Crewe, Cheshire. We offer our customers a wide range of reflective materials and finished products that are both manufacture in the UK and off shore. 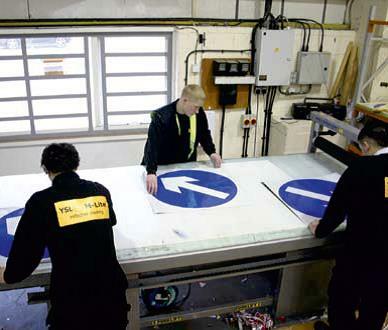 As a company VR has realised its vision to design and manufacture its own traffic management product range, bringing new and innovative products to market such as the Alpha plastic road sign. 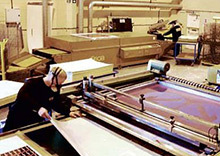 VR’s large scale semi-automatic screen printing line gives a printing capacity of 10 000 road signs a week. We also have 3 large format digital printers that allow us to produce bespoke signs on both reflective and non-reflective media. 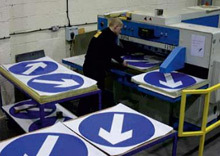 Having invested in automatic guillotine, slitting and punching machinery for the conversion of Mlite rolls, we have the capacity to bulk produce temporary road signs which we supply to key distributors. Our products are sold worldwide directly or through licensing our brands with international partners. Recently opened is our new manufacturing facility in Cheshire , the company can now offer a new range of printed sign faces and finished signs manufactured from Class 1 or class 2 materials for both the temporary or permanent market. This includes the Alpha Traffic management range of plastic signs. The VizLite range incorporates reflective tapes and films for end applications such as high visibility garments, Fire Fighters uniforms and fire retardant overalls. As supplied to manufactures of safety garments all meeting the recognized international standards that enable professionals and the public to stay visible in poor lighting conditions. A range of reflective branding systems that can be applied to finished garments to add value and strengthen brand identity. 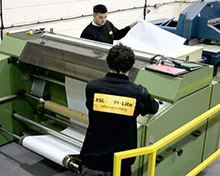 Applications include CAD cut, direct print, embossing and encapsulating. Developed in partnership with International Coatings in the United States and incorporating Mbead™ technology, the Optilux range of reflective plastisol inks add a reflective decorative dimension to garment design. YSL M-Lite™ comprises of a wide range of reflective sheeting that meets the specification EN 12899-1 2008 class 1 and class 2 including CE marking suitable for application to advertising signage, temporary and permanent road signage, vehicle graphics and delineators. The substrates come in a variable range of colours, life span and reflectivity performance. The Mbeads Brand is an array of products encompassing both metalised and clear microscopic glass beads in various mesh sizes, which can be incorporated into the manufacture of specialized reflective coatings, paints and inks.